Want to get back your loved one? Want to remove black magic? not getting success in life? obstacles in your path to success? Want protect business & family? All these kind of serious problems may happening becouse of some secret causes and doshas due to the preyer of enemies. Reveal the root cause of your problems at the time of lords NIYOGAM on at 12 noon (Book Darshan) Perform poojas and giving offerings to lord sree vishnumaya kuttichathan swamy at Karuvannur Karanayil Devasthanam will helps you to get immediate solutions to relief from your problems. Even if not seeing results after doing poojas in other temples,Here devotees can feel the changes in their life after performing the powerful poojas to the lord sree vishnumaya kuttichathan swamy. Need not worry about those who are not able to come directly, will perform poojas and after will send prasadam and pooja details to devotees address by courier (for more details contact by phone). 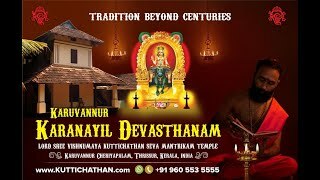 Karuvannur Karanayil Devasthanam is known as the Ancestral home of Lord Sree Vishnumaya Kuttichathan Swamy by decades, Here we are performing powerful poojas by using Ancestral Secret mantras and tantrik and mantrik karmas followed by our great Grandfathers. 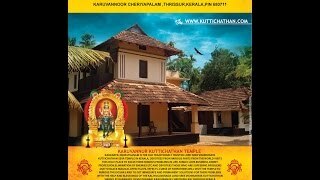 KARUVANNUR KARANAYIL DEVASTHANAM Is the Traditionaly trusted Lord Sree Vishnumaya Kuttichathan Seva mantrikam Temple Situated at Karuvannur cheriyapalam in Thrissur kerala We dont have any branches or relation with other temples or madoms situated in surroundings of Thrissur or other states. Devotees those who are visiting karuvannur karanayil devasthanam must identyfy themself by viewing the ancestral home temple showing in the above picture, And the very speciality is here lord sree vishnumaya kuttichathan swamy is living along with devasthanathipathi and other family members inside the HOME SREEKOVIL specialy built by our great grandfather more than 400yrs back, we are not constructed new generation temple or attractions becouse here we are following the tradition hand overed by our great grandfathers. Here devotees will find relief from their Sorrows and Lord Vishnumaya Swamy will showering Blessings And Prospirty to his Devotees Irrespective of Cast, Creed or Religion.Lord Sree Vishnumaya Will give immediate solutions for his devotees problems those who are giving poojas and special offering to the lord, as lord sree vishnumaya kuttichathan swamy is known as the supreme power in kaliyuga. Performing special poojas to lord vishnumaya swamy will gives you Incredible increase in wealth, Hike in profession and business,Reunion of the seperated family members or persons,Get desired things done immediately,Removel of black magic and black power effects,Elimination of the enemies,etc.Whatever complicated matters disturbing in your life can be solved by performing poojas and giving offerings to lord vishnumaya kuttichathan swamy. Devotees can feel the differences in their life after performing poojas and giving offerings to lord Vishnumaya Kuttichathan swamy At Karanayil Devasthanam. 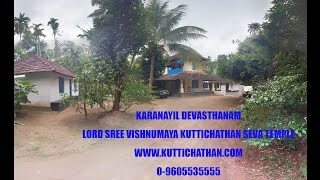 LORD VISHNUMAYA KUTTICHATHAN SEVA GIVES YOU INCREADIBLE INCREASE IN WEALTH,HIKE IN PROFESSION,GET DESIORED THINGS DONE,AND ALL THE DISTURBING MATTERS WILL BE SOLVED IMMEDIATELY.DEVOTEES CAN FELL THE DIFFERENCE IMMEDIATELY AFTER POOJAS TO THE LORD SREE VISHNUMAYA AT KARANAYIL DEVASTHANAM. It is easy to solve all the problems if you can find the root cause of the problems.Here you can tell about your problems to vishnumaya swamy at the time of Niyogam. The presence of Lord Sree Vishnumaya is felt in the Priest in the dancing form is known as niyogam. At these times you will get a stright advice from the lord about the problems and which poojas will gives you permanent solution for your problems and doshams.Niyogam starts every day at 12.00 noon(book niyogam dharshan).Those who are unable to come for niyogan can inform about Their problems to devasthanathipathi (chief priest) by phone,He will tell about your problems directly to the lord at the time of niyogan and after the niyogam details and solutions for your problems will inform to you.The lord vishnumaya swamy needs special poojas to get desiored things done and the removel of the doshams for his devotees, Here at karanayil devasthanam we are performing very old and secret pooja manthras and powerful thantrika karmas to get immediate solutions for their problems with the blessings of lord vishnumaya kuttichathan swamy, after performing poojas we will send the prasadam and pooja details with follow ups to devotees address through postel or courier.